Using mice whose front paws were still partly disabled after an initial induced stroke, Johns Hopkins researchers report that inducing a second stroke nearby in their brains let them "rehab" the animals to successfully grab food pellets with those paws at pre-stroke efficiency. The findings, described online Dec. 31, 2015, in Neurorehabilitation and Neural Repair, show that the "window of opportunity" for recovering motor function after a stroke isn't permanently closed after brain damage from an earlier stroke and can reopen under certain conditions, in conjunction with rapid rehabilitation efforts. The investigators strongly emphasize that their experiments do not and will never make a case for inducing strokes as a therapy in people with stroke disability. But they do suggest the mammalian brain may be far more "plastic" in such patients, and that safe and ethical ways might be found to better exploit that plasticity and reopen the recovery window for people who have never fully regained control of their motor movements. "If we can better understand how to reopen or extend the optimal recovery period after a stroke, then we might indeed change how we treat patients for the better," says Steven Zeiler, M.D., Ph.D., assistant professor of neurology at the Johns Hopkins University School of Medicine. "Our study adds new strong and convincing evidence that there is a sensitive period following stroke where it's easiest to relearn motor movements—a topic that is still debated among stroke researchers." The new mouse experiments build on a previous study at Johns Hopkins, which found that the window of optimal recovery following a stroke in mice was within the first seven days, but this time period could be extended by giving mice the common antidepressant fluoxetine immediately after the stroke. The investigators suspected that the antidepressant increased the brain's response to learning. Until now, however, the researchers say, there was no evidence that once the optimal period was over—with or without fluoxetine—the potential for recovery could be reopened. For the new research, which did not involve the use of the antidepressant, the researchers—as in their first experiments—taught mice to reach through a slit in their cage with their front paw to grasp food pellets affixed to a bar, a task that four-legged animals don't naturally perform. Once the mice became efficient at the task—it took about 10 days of training—the researchers measured their individual success rates. On average, they found the mice successfully grabbed pellets just over 50 percent of the time. 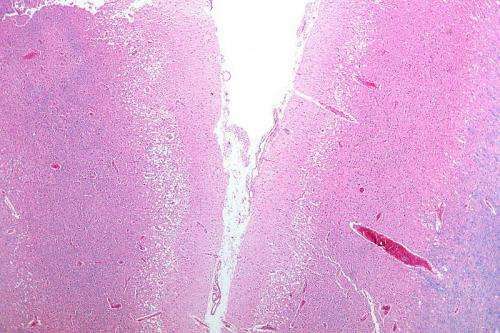 The researchers then induced a stroke in the motor cortex of the mice's brains, making them unable to perform the task. After waiting a week—well beyond the known "optimal" window during which rehab training will work—they put the mice through almost three weeks of task training, during which the mice successfully grabbed the pellets again, but only about 30 percent of the time. For the next phase of the experiment, the scientists built on previous research and observations in mice that brain ischemia—the cutoff or reduction of oxygen to the brain during a stroke or other insult to the cortex—under certain conditions increased brain plasticity, the ability of the brain to compensate for injury and form new connections. To that end, the scientists induced a second stroke in the lab mice either in the secondary motor cortex near the first stroke site or, for purposes of a control group, in the visual cortex, located far from the original site. Instead of waiting days, the investigators began retraining these mice the next day and found that mice with the follow-up stroke in the motor cortex relearned to grasp the food pellets just as well as they did before the first stroke, with success more than 50 percent of the time. Mice in the control group never did any better, even with extended training, suggesting that the motor cortex may be the only part of the brain with this type of "reopening" capability for motor movements, the investigators say. Zeiler plans to investigate other ways to reopen the window of recovery and make use of the optimal recovery window. The lead investigator of the study, John Krakauer, M.D., M.A., professor of neurology, directs the Brain, Learning, Animation and Movement Lab, which uses basic science data, like that in this study, to develop new patient therapies. Currently, the lab is investigating the importance of early and intense rehabilitation in patients to enhance brain plasticity after stroke. According to the Centers for Disease Control and Prevention, in the U.S., stroke is the No. 1 cause of disability and costs $34 billion each year in in health care, medications and missed days of work.